Krystal Horton is the clever kid behind the blog Raspberry Pi Kid: An 11-Year-Old’s Adventures with Raspberry Pi. 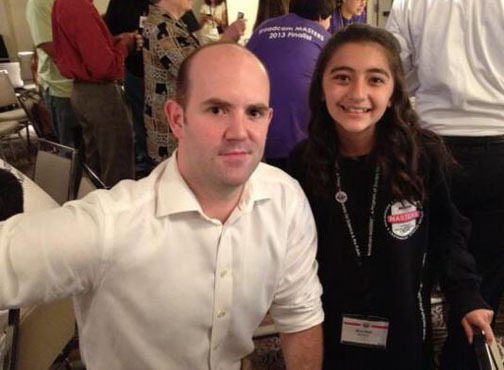 Since starting her blog in January 2013, her entries have covered everything from unpacking her first Pi, to projects she has created with the SBC, to her recent dinner with Eben Upton, founder and trustee of the Raspberry Pi Foundation, and his wife, Liz Upton, who oversees the foundation website. Liz Upton describes Krystal as “brilliant.” Recently, Circuit Cellar Managing Editor Mary Wilson asked the seventh-grader several questions about her interest in the Raspberry Pi and the blog she created to complement it. 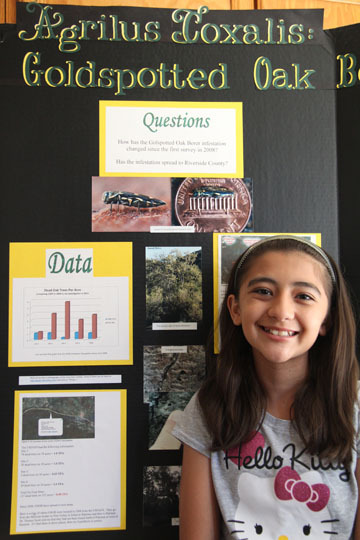 Krystal and her oak borer beetle infestation science project. MARY: Tell us a little bit about yourself and why you became interested in working with the Raspberry Pi. 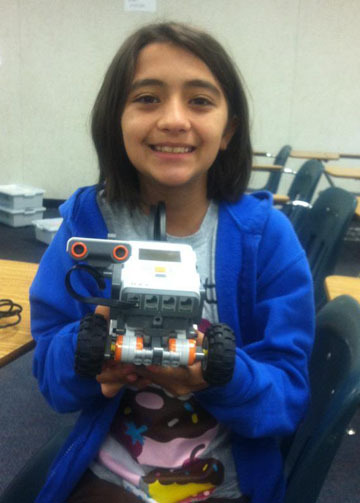 KRYSTAL: I am an 11-year-old seventh-grader in Southern California. I have been interested in science and technology ever since I can remember. My cousin got a Raspberry Pi for Christmas and my uncle saw how curious I was. So, he gave me one for New Year’s. He gave me some basic lessons on how to hook it up, turn it on, and type into Vim. That and some YouTube videos, tutorials, and eBooks and I was off and running. I now blog at http://raspberrypikid.wordpress.com and sometimes I tweet through @kid_pi. MARY: Why did you decide to start your blog Raspberry Pi Kid? What type of feedback/comments have you gotten from visitors to your site? Will you rename the blog and keep posting when you’re 12? KRYSTAL: I’ve learned so much from other people’s blogs, but they’re written for adults and are very hard for a kid to understand. So, I thought that I could put things in kid language and in simple steps so that other kids would be inspired and learn from what I’ve done. I want to give back to the Raspberry Pi and blogging communities. On my blog, I’m often talking about problems that I’m having (I still haven’t figured out analog to digital conversion) and a lot of people offer to help me out. Others congratulate me and wish that they’d had an RPi when they were my age. I’ve also heard from other kids my age who are learning to code. I put my dad’s email address on the account and he gets invitations for me to Skype with CoderDojos and to guest blog for people. I have over 52,000 views to my blog right now. I hadn’t even thought about whether the name would change when I turn 12, but I’ll definitely keep blogging. MARY: Was the SBC difficult to set up? What was the first project you worked on with it? KRYSTAL: The only hard thing about setting it up is all of the accessories that you need. It doesn’t even come with a power supply, keyboard, or mouse. My uncle gave me some of the stuff (power supply, wireless keyboard/mouse, breadboard), I had some stuff at home (memory card, network cable), and I bought some stuff from Adafruit’s very useful website (wireless adapter, ADC chip, breadboard accessories). I really like the idea of programming the computer to do things. So, the first thing I did was start programming in Python through Vim and IDLE. I got a book from the library, read tutorials online, and emailed my uncle questions. MARY: Can you tell me about some other Pi-based projects you have finished or are working on? Do you have something you would like to do next? Where do you get your ideas? Where do you go for guidance? KRYSTAL: I love playing Minecraft, so when I saw that there’s a Pi version, I installed it and blogged about it. I’ve also used the Scratch programming language to create games and blink LEDs. I’ve used RPi as a Linux computer with the Wheezy version. I just wish that Midori would play YouTube videos so that I could watch Pi tutorials on my Pi. I have also installed OpenELEC (Open Embedded Linux Entertainment Center) so that I can stream HD video to my TV. I’ve also used PuTTY to control the Pi with a laptop (my uncle showed me that one). In the future, I want to keep working with Scratch, a free visual programming language for kids from MIT (where I want to go to college). I want to figure out analog to digital so that I can connect sensors. And I want to use the RPi to do a science fair project. I really, really want to get a 3-D printer and connect it to the Pi. I’m planning to order a MakiBOX soon, but it’ll take six-10 weeks to arrive and then I have to build it and learn how to use it. When I don’t know how to do something, my dad helps me find answers on YouTube or other people’s blogs. He’s a scientist, not a programmer, so he learns with me sometimes. If he can’t help me, I email my uncle who does know how to program. He has automated his house with a RasPi. If I can’t get in touch with him, then I post a question on a forum and wait for answers. MARY: What were some of the challenges you had to overcome with the Pi? What, if anything, would you change about it? KRYSTAL: One of the problems I’ve had is when things don’t work for me as the blogs say they should. I had a really hard time getting Wi-Fi to work even though I followed the instructions exactly. If I could change anything, I’d label the GPIO pins right on the board. I’ve had to look up that diagram soooo many times. There are several versions now, so I’d recommend marking them to make it easier to tell which one it is when getting a case for it. I’ve read stories about people breaking off the connector where the memory card goes. That’s scary, I hope they fix that if they can. MARY: What do you think are the SBC’s best features? KRYSTAL: Everyone says that the price and size are the Pi’s best features and I agree. But I also like that it’s so open to let me put any kind of Linux I want on it. Some people have even put the Android Operating System on it. Not me… yet. MARY: What new skills/tools have you learned about through your Pi? KRYSTAL: Some of the things I’ve learned through using my Pi are: coding in Python and Scratch, basic electronics (how to use a breadboard, multimeter, LEDs, etc. ), and using Linux and all of the absolutely free software for it. These are very valuable skills for anyone to learn. I’ve learned about IP addresses and using a computer without the graphical interface at times also. MARY: What advice would you give to another kid (or adult tinkerer) who is interested in getting started with the Raspberry Pi? KRYSTAL: The advice that I’d give is to work on fun projects. This shouldn’t feel like boring work. Also, don’t get frustrated if things don’t work right the first time. That’s just part of coding. Most big cities also have groups of computer users. Find one and connect with them. MARY: How many other 11-year-old girls do you know who are drawn to the Raspberry Pi? Any thoughts about that? KRYSTAL: I’ve met online several kids who are using Pi. I spoke through Skype with a group in Washington, D.C., one Saturday morning. There were probably 15 kids and many were girls. 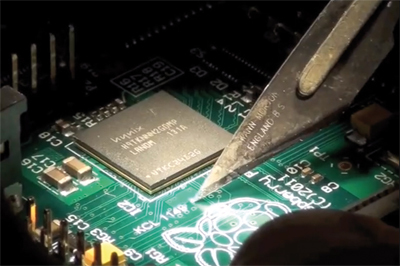 I watched a video of a girl who tests all of the Raspberry Pis that get sent back as broken. I think that computers and technology are going to be incredibly important to my generation. It is very scary that so few (girls or boys) are learning how technology works and how to code. Coders are going to rule the future, and I want be a part of that. All kids should. And their parents need to encourage it. Websites like code.org and adafruit.com and devices like Raspberry Pi are helping.